As I posted a couple of days ago , we cooked the whole chicken (sent to me for review by Abel & Cole). The cooking liquid turned into a fabulous stock, which was frozen in two generous portions. The meat was divided into four portions, with two of those frozen as well. The carcass and neck was put back into the slow cooker that night with fresh liquid to create a second serving of stock, which went into the fridge along with a portion of the meat. We ate the first portion of meat in a crunchy summer salad on Sunday evening. On Monday night Pete used the stock from the fridge to make a delicious creamy risotto. To the base he added a portion of the chicken meat and the spring onions from the fruit & veg box, both finely chopped. A little seasoning salt was all that was needed to elevate these simple, good quality ingredients into a lip-smackingly tasty weekday dinner. It doesn’t appear as creamy in the photograph as it felt and tasted on eating! How many meals can you get from one good-quality, 1.9 kilo free-range chicken? Given that we have enough chicken meat and stock (two portions of each) in the freezer for two further meals, possibly more depending on what we use them for. So it looks like the answer = at least 4! 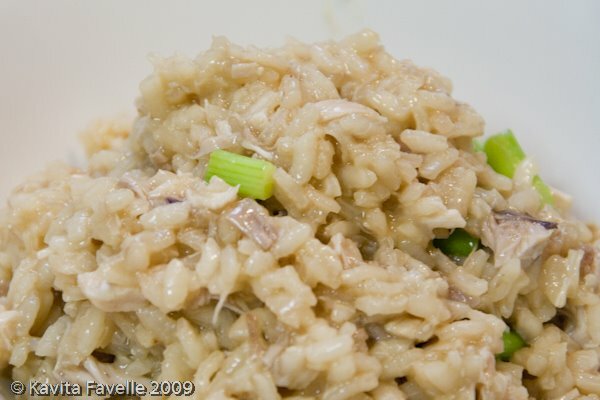 We may well make chicken risotto again at least once but would love to read your suggestions on other ideas for the chicken meat and stock. Thanks!